In two separate administrative orders signed by Secretary Ramon Paje earlier this month, the DENR designated the Sabang Bay in Puerto Galera, Oriental Mindoro and the Coron Bay in Palawan as WQMAs, bringing the total number of WQMAs in the country to 25. The initiative is seen to boost efforts to protect the bustling biodiversity within the two water bodies from the unwanted effects of tourism activities in those areas. Both Sabang Bay and Coron Bay are world-class diving sites with great visibility and masses of underwater life, making them as among the favorite destinations for tourists and diving enthusiasts. "These latest WQMA designations are critical to effectively address development issues on safeguarding the areas’ ecosystem qualities from the rapid growth of tourism activities in the towns of Coron and Puerto Galera, while sustaining the economic benefits for the local host communities," Paje said. As diving tourism and the associated residential and commercial developments "exert a considerable pressure on the ecological fabric" of the two bay areas, Paje said there is absolutely a need to ensure that their water qualities comply with the standards prescribed under Republic Act No. 9275, or the Philippine Clean Water Act. He added that strong reliance on healthy and attractive coral reefs makes the tourism sector in Coron and Puerto Galera "particularly vulnerable to the impacts of climate change." According to the environment chief, the WQMA designation would provide the DENR, local government units, communities and other stakeholders identify the water quality problems, sources of pollution and the beneficial use of Sabang Bay and Coron Bay. It would also help stakeholders determine what control measures to institute to effectively achieve water quality objectives or improvements. The Coron Bay WQMA covers the bay itself and eight of the 23 barangays comprising the entire town of Coron. An analysis of Coron’s water resources and its distribution showed that the rivers traversing the town drain into a drainage area of 5.5 hectares located inside the eight coastal villages. On the other hand, the Sabang Bay WQMA covers the bay itself, which is part of the world famous Verde Island Passage, and the whole Barangay Sabang covering 449 hectares. 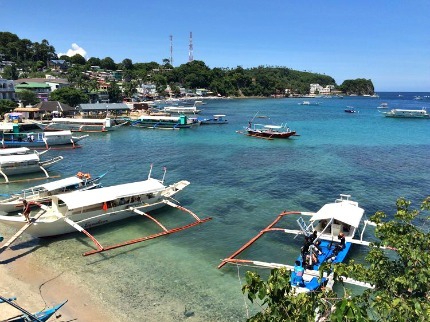 West of Sabang Bay, separated by the Batangas Channel, is the Muelle Bay which is the only bay in the Philippines listed in the “Club of the Most Beautiful Bays of the World” by the Paris-based Club Des Plus Belles Baies Du Monde in 2005.